Billy Graham is home, after 99 years. He was one of the most influential evangelists to ever live and in 2008, it was estimated that he had preached to over 2.2 billion people, through live crusades, TV, and radio. I can’t even wrap my brain around a number like that. To put it in perspective, he preached to more people than there are living in China, and they have the highest population in the world at 1.4 billion! Can you imagine the homecoming reception he had yesterday? I don’t usually pre-plan my blog posts but just write whatever’s on my heart in the morning… but I did think I might spend time writing about Billy Graham today. When I read my Bible this morning, it was confirmed, and once again, God amazes me with His timing! 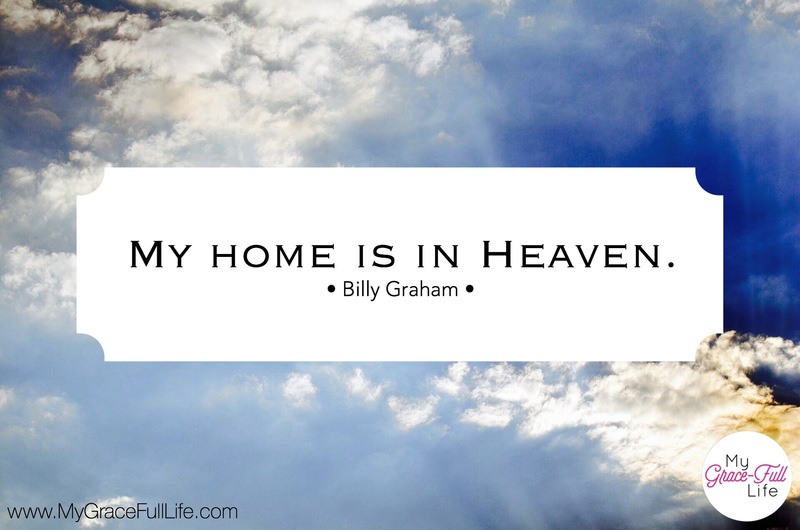 I can’t help but wonder if that verse was influential on Billy Graham’s immortal quote! We may think Billy Graham had a long life at 99, and we can certainly all agree that it was full and purposeful. But in comparison to eternity? His earthly life was short in comparison to the eternal life he’s just begun! We can’t begin to compare our own legacy to that of Dr. Graham’s, and we shouldn’t even try. When you are in heaven, will there be those who thank you for the impact you had on their lives? After all, this isn’t some archaic book we study. It’s as relevant today as ever! Billy Graham lived that because he believed it. He preached it, modeled it, influenced others. And by growing more like Christ, we can more heartily take on the great commission, as instructed by Christ in Matthew 28:19-20… a commission that’s applicable to each of us, whether we’re a banker, an architect, a manager, a ditch digger, or the next Billy Graham. Today, as you pray, thank God for the life of Billy Graham and the immeasurable work he did for the Kingdom of God. Ask God to help you leave your own legacy for those you come in contact with – not a personal legacy, but a legacy of a life spent loving Jesus and living for Him.